Making a wood trout glide bait is a great way to handcraft a lure that will catch a variety of gamefish. 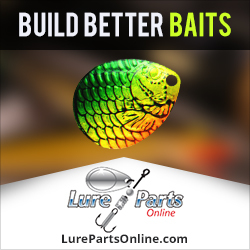 With a glide bait you can expect to catch Largemouth and Smallmouth Bass, Northern Pike and Musky. It can also be used for other large freshwater fish around the globe. And making the lure yourself gives you the satisfaction of catching fish on something that you created, not just something bought from the shelves of a retail store or online shop. That alone makes it worth spending the time making a wood trout glide bait. Lure maker Paul Adams is today’s instructor. 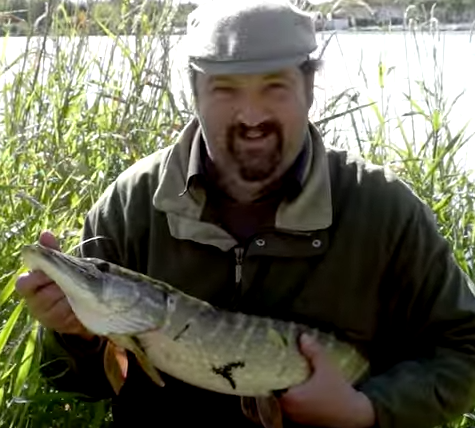 Paul has been making homemade lures for many years and always presents a great tutorial. Paul starts out by showing us how he shapes his initial piece of wood. He draws out the desired shape on his wood material, using a paper template. Then he cuts it on a band saw. He then refines it a bit, using pencil marks and some sanding. 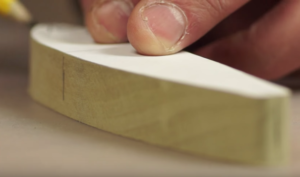 Paul then uses a craft knife to carve the square edges off the body. This gives it rounded edges, to more closely resemble the body of a trout. You’ll notice that a bit of sanding to further shape and smooth the wood lure body helps bring it even closer to the finished shape. As Paul works with the sandpaper, it gives the lure a smooth surface texture that’s close to being ready for painting. Once the desired shape is achieved, then it’s time to start working on other details, such as eye sockets, holes for screw eyes and larger holes for weights to be inserted into the belly of the lure. 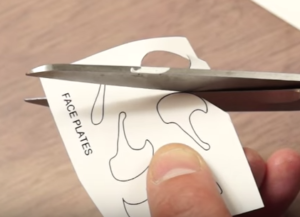 Paul goes into great detail about how he creates the facial details of the trout, using more paper stencils, double-sided tape and epoxy. The results of this are impressive, as they give the face area of the lure a 3-dimensional realism. At first this might seem like overkill and unnecessary. But as Paul progresses, the finished result shows that the extra work is well worth the effort! Next, it’s time for some textured foil to be applied to the sides of the lure. This adds a very light scale look and will create more realism under the paint that is yet to be sprayed on. And then it’s time for paint and the first coat of epoxy to be applied. And after letting it dry until the epoxy is tacky, a final coat of epoxy is applied. The lure is then left to dry for approximately 24 hours. Paul is careful to use small amounts of heat on the epoxy finish shortly after brushing it on, to prevent bubbles from forming as the lure dries. Now, it’s time to go ahead and watch Paul walk through all of these steps in the video tutorial he created. 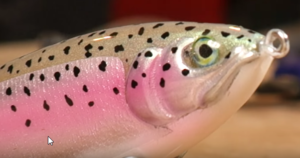 This entry was posted in Making Wooden Lures and tagged how to carve a glide bait, how to carve a swimbait, How to make a glide bait, how to make a wood swimbait, making a wood swimbait by hand, Making a Wood Trout Glide Bait on August 23, 2016 by Lure Parts Online.